← So, how long did it take for rosefish to crash? Well, I am a historian. And the short answer is that it’s been roughly 60 years since the Soviet fleets decimated the population of Pacific Ocean Perch off Oregon and Washington, and the stocks still have not recovered. There has indeed been some limited recovery off Alaska, and two years of improved escapement of Oregon. I’m interested in how this happened. The quick answer is that we went fishing without knowing how old the fish were and the fish were far older than anybody thought. The technology to catch the fish spread very, very rapidly. The science to understand the biology of the fish happened very, very slowly. Why? Because the fish live in very deep water, reproduce very slowly, and only when ocean conditions are right. The larger, older females play an outsized role in reproduction, releasing larger numbers of more viable offspring. The fish might reproduce once in a decade, maybe more often, maybe less often. And what this means is that relatively few fish are available for harvest on an annual basis, because there have to be enough females left in the population to get the stock through to the next set of good ocean conditions. Sebastes are interesting to study because they occur throughout the North Pacific, as well as the North Atlantic. That means you can compare how management handled the fish under a variety of different strategies. And it means I can trace a story that starts in Newport, Oregon, throughout the entire Pacific and Atlantic oceans. That’s pretty cool. I’m interested in exploring, with some oceanography colleagues at Oregon State, the cascade of ecological changes that happened after the Soviet fishery. Did the removal of rosefish off Alaska set up conditions for pollock (Theragra chalcogramma) to became one the world’s largest and most successful fisheries? 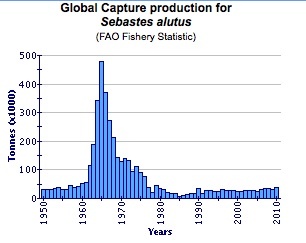 Pollock stocks are now depleted–what role did that play in the surge of arrowtooth flounder (Atheresthes stomias) off Alaska? These intense fisheries weakened the population structure of the fish communities in the Pacific. Ecologists sees humans as one part of a vast system of ecosystems. We are all dependent on the ultimate health of the system, and of all its components. By focusing on the history of fishing, I hope to add a piece of understanding to the history of ecology in the oceans. If we can understand why we did things, and why we created the policies we did, I hope that can lead to a better conversation about the policies we need to have in the future, to ensure that rosefish come back to the ocean off Oregon, where they belong. This entry was posted in Environmental History, Fisheries policy, Marine Policy, Maritime History, Pacific Fishing History Project and tagged arrowtooth flounder, Fisheries Science, Fishing, groundfish, Pacific Fishery History Project, Pacific Ocean Perch, pollock, rosefish. Bookmark the permalink.